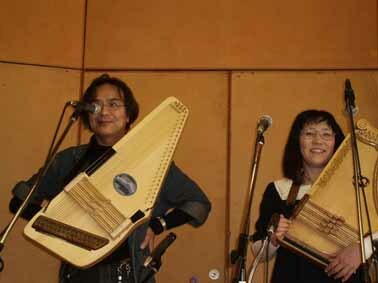 Here comes the 2008 Japan autoharp event ! Mr. Ueno designed and make the handicraft singnboard of the festival. It forms the symbol of an Autoharp & a Hammer dulcimer. Mr. Ueno have held this Great Japan Autoharp Event since the Summer of 2002. The town where he has lived in , Minori has a sister city relationship with Abilene, Kansas. Eddie & Robert Hiebert were invited in the Autumn of 2000. They have played the beautiful autoharp & dulcimer everywhere in town. Mr. Ueno has been moved deeply by the response and has invited to them. It was a gathering for people he has known and I have seen him after the Spring of 2002. And then the event grew until it became the autoharp festival. This is the story of the origin of this event. You can read more about the story at the back of the Autoharp Quarterly, In the Fall 2005 article by Robert and 2006 report by Taeko. This year, the rainy season came over early from the average year. It did not yet rain, but we worried about rain on that day. However, autoharpers were not disappointed because of the rain. We looked forward to this event for some months. This year we are thankful that we were able to participate in this, too. Why, we spent a splendid time together. My partner arrived at the meeting place early. A few people had already gathered. I had several Autoharps and changed at several trains. The Autoharp encourages me when I go to a place that I do not know or when I do a trip alone. I am not lonely at all with my autoharps . It is a rather pleasant trip. But, but it was very hard for me because of problem of carrying my AutoharpS! Mr. and Mrs. Ueno and my friend Chisumon had been waiting patiently when I arrived at our meeting place. Soon the greeting was over, and we were already crazy about Autoharpo stories . Ueno was a big surprised to see our Autoharps. I was also a BIG surprised to see "George's choice" of the Orthey special 'harp for her owner. It was one of them I was interest in. Ueno asked us to set up for the Autoharp booth. We opened the Autoharp booth in a hurry. OHHH, I cannot wait to begin the festival. Our festival is on an open stage entirely. All people performing must have an entry till one week before. The Autoharps and the Dulcimers stand to play wonderful music on the stages in turn. I arranged favorite foods and drinks on a table and enjoyed shows. It was not a problem that we had a number of people and impending rain. 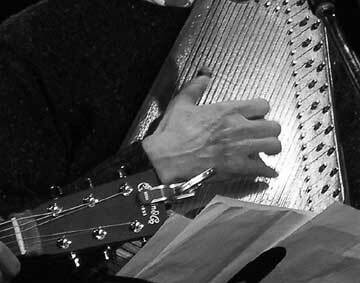 There was never an event of Autoharp more pleasant. He did a really great performance on several autoharps and did sing along with his playing, too. This year we also enjoyed his solo stage. When his performance begins, one lady whispered to me " WoW, what a sweet sound. He is beautiful !!". She showed off her dress this year, too. She said first "You have already looked at my dress? My show is finished!" . She played diatonic autoharps this time, and open chording and modal one tune, Hunting The Buffalo. 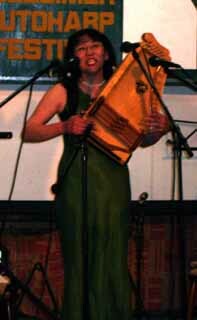 Her autoharp style is very pawerful and faster, but like her dress.... it is beautiful and green. We had a great time. It is the wonderful bluegrass gathering with friendly people . 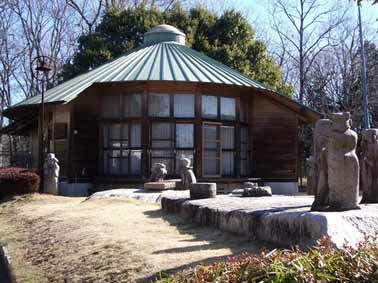 The place is Ibaraki Pref., and it has public accommodation. I have never attended this event before. We enjoyed hearing the excellent stage performances and delicious foods, etc. The bands came from near and so far, Chiba, Tokyo, Kanagawa, Shizuoka, Nagano, Saitama,Tochigi and so forth, and the audience members came from far & near too! Community Center, neighboring people and the students of Clay's university and his friends and family. It also included a German, an American and someone Chinese. There may be more, but I am not sure. A Chinese man, Lin Sensei, also played "NIKO" for the Japanese song "Sakura". It was mixed unique Chinese melody, I think. We brought some drinks and some food, while enjoying the shows. The ticket of the participation was exchanged for free two drinks and two free dishes. And the food donations were happily accepted. So...I cannot say how much we enjoyed such a wonderful day. I can only say that I felt like six hours passed in a moment!!! Clay and Nakamura say that we thought about this event. It is "Just Fun!." Clay said, The Teikin Ourai Band - we enjoyed a great taste of autoharp. Thank you for coming so far, bringing great Easter eggs & giving us a fine treat. Clay Bussinger and NAKAMURA Youichi are teachers at the same university. Clay has lived there for six years and he loves bluegrass music and guitar. Youich has never told to Clay before but he has known Clay loves music. One day Youich asked him what kind do you like. Clay answered with bluegrass music. Youich was very surprised because he loves the Carter family. Then they became friends. Clay wanted to hold a bluegrass event. Youichi's response was "Yes ! We do it!" and he supports the Japanese language for people. So it began this event!. 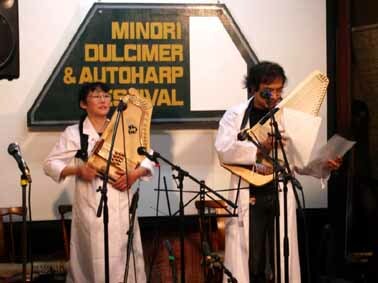 I have seen Clay at the Minori Dulcimer & Autoharp festival before. He sent me a lot of the information and event photos every time. So I knew the GTCC BG. I was very excited to attend and to meet Clay and Youichi again. 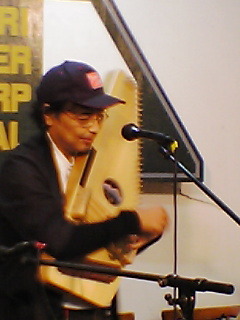 Yes, we have known Youichi before, because he is one of them who attended my Sakura Autoharp Gathering at 2001. However they have not told together about us. It was a big day. Clay and Youich and my friend Chisumon and me, we have been knowing each other but it became the first day we meet together! Sometimes autoharp will makes a Synchronicity! The OLD TIME FRIEDS is a band-name. They sing and play songs of Folk and Bluegrass, old time , Japanese song. The style is very unique and I can not bear laughter because they translate from Japanese or English into their dialect and sing. 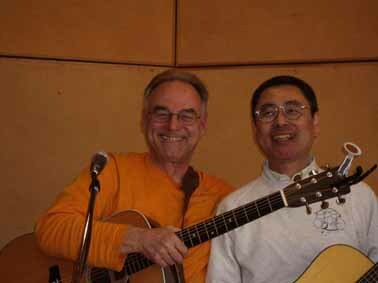 Ken & Yutaka are old friends and they have been enjoying American music since in school days. Ken became a professional musician and now he has active in TV and Radio, stage activity performances. This year , 2008, he wrote a book How to play banjo, Melodic Clawhammer Banjo, that is little players in Japan. Yutaka is a great autoharp player ,however he did not become a pro musician. And he is one of two autoharp instructors on the Video in Japan. His Video for new players is remade the DVD these days. Their friend Masao is also a great guitarist. They have some stages in KYOTO area. I must run hearing them!!! Hakone Bluegrass Festival, Mountain Folk, other famas bluegrass festival, some music events. 1. It stepped on some records and radio of Western music at the beginning of 1960's. The radio station just opened it at that time in Japan. 2. At the early 1960's, the United States business firm men brought the musical instrument catalogues to Japan. 3. It was introduced to Japan by propagators of a church. 4. Other one way, it was introduced in a field of musical therapy led by the university. 5.The Autoharp conflicted with a lot of Japanese eyes by the story tailor Fran-san.